Msgr. 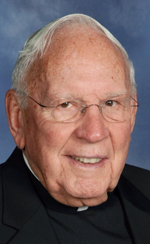 Richard J. Skelly, 89, pastor emeritus of Our Lady of Perpetual Help Parish in Morton, died Jan. 26. Born in Norristown, the son of the late Daniel A. Skelly and the late Agnes M. (Powers) Skelly, he attended West Norriton Elementary School, St. Francis of Assisi School, Norristown and West Philadelphia Catholic High School for Boys before entering St. Charles Borromeo Seminary. He was ordained May 8, 1954 by Archbishop John F. O’Hara at the Cathedral of SS. Peter and Paul. His first assignments were as parochial vicar at Annunciation Parish, Shenandoah and St. James Parish, Philadelphia. He then entered the education apostolate, serving on the faculties of St. Thomas More High School, Msgr. Bonner High School and Bishop McDevitt High School. This was followed by pastor of St. Joseph Parish, Cheltenham and in 1988, pastor of Our Lady of Perpetual Help where he served until he was named pastor emeritus in 2003. Father Kevin Murray, who was a parochial vicar at Our Lady of Perpetual Help, remembers him as a mild and gentle man, compassionate to the sick and no matter how far he would find the time to be there for them. Father Murray was happy in his previous assignment, but his six years with Msgr. Skelly “were the happiest of my priesthood,” he said. Under Father Skelly priests were always welcome, and Saturday nights especially there would be a large gathering of priest-friends at the rectory. Parishioners also have fond memories of their former pastor. As an Irishman, Msgr. Skelly had a special devotion to Our Lady of Knock and “the choir would often sing her hymn just for him,” Sweeney recalls. A viewing for Father Skelly will be held at Our Lady of Perpetual Help on Thursday, Feb. 2 at 4 p.m. followed by a 7 p.m. parish Mass. Msgr. Skelly’s Funeral Mass will be celebrated by Archbishop Charles J. Chaput at St. Joseph Church, Aston, on Friday, Feb. 3. The Mass will be preceded by a viewing. Concelebrants will include Bishop Joseph R. Cistone, Fathers Robert Vogan and Anthony DiGuglielmo and Father Murray, who will be the homilist. Msgr. Skelly is survived by his sisters, Rosemary Backus and Joanne Dougherty, and his brothers William Skelly and Dr. Daniel Skelly and nephews and nieces. Interment will be at St. Patrick Cemetery, Norristown.